What follows is an overview of joint aspiration techniques in the upper extremity. We will be covering the shoulder, elbow, and wrist. Identify your landmarks. In this setting, the skin marker is your friend. See the following pictures. 1. Find the coracoid. Mark it with a circle. 2. Find the notch where the acromion and the clavicle meet. Mark it with a point. 3. Find the anterolateral and posterolateral corners of the acromion. Mark each with a point. These two points should make an equilateral triangle with your point from #2. 4. Roll your marker off the lateral edge of the acromion. Mark this line. 5. Draw out the borders of the clavicle and the scapular spine. Two common sites of entry are the posterior and anterior approaches. You will find that some patients have better landmarks posteriorly or anteriorly – this can vary depending on patient habitus and positioning. The posterior approach traditionally begins approximately 2cm medial and inferior from the posterolateral corner of the acromion. You should feel a soft spot here. In a patient without a septic joint, you can move the humeral head anteriorly and posteriorly and feel the joint from this spot. When aspirating from the posterior approach, go in through the soft spot and point your needle toward the coracoid circle you marked previously. The anterior approach uses your coracoid landmark to protect yourself from injuring important neurovascular structures. Never go medial to the coracoid. Your insertion spot will be just lateral to the coracoid. Aim directly posterior and slightly superior. 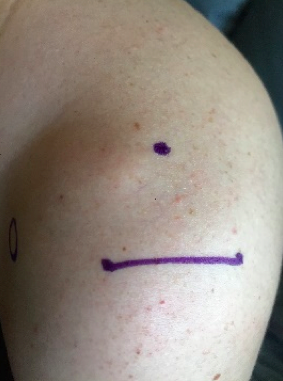 When dealing with shoulder injections with distorted anatomy (for example, in the shoulder dislocation), it can still be helpful to draw out the anatomy and imagine where it will be easiest to enter the joint. For instance, in an anterior shoulder dislocation, you may be able to palpate the humeral head anteriorly and easily enter the joint space around the humeral head. Identify your landmarks. Again, the skin marker can be helpful to visualize your entry point. With the elbow at 45-90° flexion, mark the lateral epicondyle of the humerus with a point. 2. Mark the radial head with a point. You can identify this by pronating and supinating the forearm and feeling the rotation of the radial head. 3. 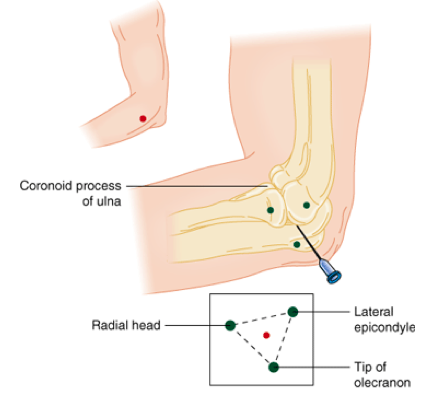 Mark the tip of the olecranon with a point. The three points should make something close to an equilateral triangle. Your entry point will be in the center of the triangle. Again, you should feel a soft spot here. When directing your needle, orient it perpendicular to the skin and go straight in. Find Lister’s tubercle (tubercle on the dorsal distal tip of the radius). Your entry point will be approximately 1cm distal to this tubercle. Find the extensor tendons of the thumb and index finger (extensor pollicis longus and extensor digitorum communis/extensor indicis proprius). Your entry point will be between these tendons. You should feel a soft spot at the wrist joint between these landmarks. It may be helpful to flex the wrist slightly (15-30°) and to point your needle proximally (30-45°) to respect the slope of the distal radius. Another helpful trick is to have an assistant grab the patient’s forearm with one hand and the patient’s index and middle fingers with the other hand, and distract across the joint to open up the space. Alternatively, you could hang the arm up in finger-traps for the same effect. "Arthrocentesis & Injections: Wrist (Radiocarpal)." RheumaKnowledgy Arthrocentesis Injections Wrist Radiocarpal Comments. N.p., 15 Oct. 2014. Web. 14 May 2017. To produce greater suction power needed to aspirate viscous fluid, use a larger bore needle and a smaller syringe. If there is any question about length of needle needed to reach the joint, use a spinal needle to avoid multiple attempts. However, in smaller joints, a shorter needle is preferable because it will improve your proprioceptive senses. If you enter and hit bone, don’t panic, just try to visualize the anatomy and redirect your needle gently. If anesthetizing the skin/subcutaneous tissue prior to aspiration, be careful to stay subcutaneous, as injecting lidocaine into the joint space would jeopardize the accuracy of your cell count results. Aspiration may be done to obtain crystals for a diagnosis of gout. Therapeutic aspiration of a hemarthrosis should not be done routinely, and should only be used as a last resort if noninvasive measures (immobilization, compression, ice, analgesics) have failed. Aspiration through cellulitis should generally be avoided due to the risk of seeding an uninfected joint. Aspiration of prosthetic joints should not be performed by the Emergency Medicine provider for the same reason as above, and the decision on whether or not to do so should be deferred to Orthopaedic Surgery. Anticoagulation is not a contraindication for aspiration. Thanks Dr. Ford and Dr. Hemmert for this procedure guide. A thorough understanding of these techniques is essential to the general emergency physician. 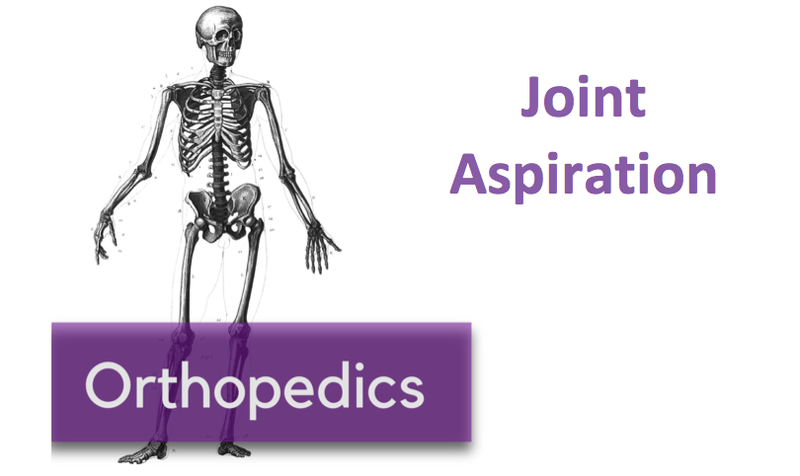 Outside of an academic center, you will be the one aspirating joints in the ED (with the exception of the hip). Rare is the day you'll have your orthopedist in the department for help with this diagnostic part of the work-up. So it is imperative we can safely and efficiently get this done. This review focuses a lot on anatomy and skin markers. Rightly so. Much like a lumbar puncture, the more time you spend on accurate positioning and palpation, the fewer times you'll poke, the less pain you'll cause, and the more likely you are to produce an atraumatic aspiration. I urge you to feel these bony landmarks on yourself. If you don't do this every day, this can be difficult. Even on the most slender of people (and few patients fit that description), feeling a coracoid process or radial head may be difficult. Whether I can feel the landmarks perfectly or not, I love to spend 60 seconds and use ultrasound. It can find bones deep in the soft tissues of the obese, it can find surprising locations of joint spaces and can also give you a better idea of the trajectory your needle ought to pass. Great for patient satisfaction. Very simple. Just use the linear probe and place it across the expected joint line so you can see bone on left, bone on right, space in the middle. Then mark the skin. No need to use it during the aspiration itself, just while marking the skin. Regarding the specific techniques listed here, the descriptions are fantastic. I can only add that, for the wrist, you will also like to avoid puncturing the extensor carpi radialis brevis tendon. If you have the patient actively extend the wrist a little (may be painful), you should feel the tendon between the tendons of the extensor digitorum and extensor pollicus longus. I'd go just ulnar to that. Posted on May 7, 2018 by NUEM Blog and filed under Orthopedics and tagged joint aspiration septic joint shoulder aspiration elbow aspitation wrist aspiration.